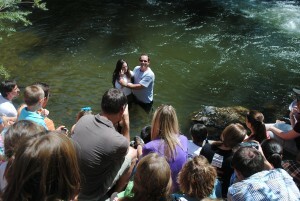 From Pastor Guy, “What a special time together last Sunday at the Baptism! Thanks to all of you who were able to come and show your support for those being baptized. There was quite a crowd! “I find myself praying that the memory of that day will stay in the minds of those baptized for many years to come. It is quite a spectacle when you think about it! A person willingly stands in an icy cold creek with tubers and swimmers all around, and agrees to let someone push them under the water (and, hopefully, pull them up again) while a whole lot of folks watching this thing bust out in applause and singing! That’s whacky! No wonder so many people prefer to be baptized in a church. It’s a lot more private! But could it be more fun?